In my ongoing effort to catch-up to the present day I bring you a quick photo report of my business trip to the UK in Spring 2016. My client has a location in Leicester that was deemed important enough for us to spend a week reviewing procedures so plans were made and tickets booked. In order to sample more products I booked Delta Business Class (ATL-LHR) on the outbound and Virgin Atlantic Upper Class (LHR-ATL) on the return. This was also done so I could visit the Virgin Clubhouse at LHR. From London, I took a East Midlands train to Leicester the same day of arrival and then 5 days later on the return. Hotel options aren’t great in the city center of Leicester so I booked at the MERCURE LEICESTER THE GRAND and the final night in London was spent at HILTON LONDON METROPOLE. The Mecure property was OK but was definitely starting to show its age. The Hilton Metropole was a pretty standard big-city Hilton property. I wouldn’t go out of my way to stay at either property in the future. One really cool aspect of the trip was that Leicester City was one week away from claiming the EPL title. The city was alive with team spirit and was quite enjoyable to experience the pride the city felt in the team. To this day, I will support Leicester City when I happen to turn on EPL. Delta Business Class seat. Booked last minute so got stuck in a middle section on the older hard product. I know, first world problems. View from outside looking in to St Pancras Station in London. This is where the East Midlands train departed to Leicester. Brick Lane Market. The London Marathon was going on the day I arrived so a lot of areas were blocked off due to the marathon route. This was a really cool market scene with lots of good street food and great people watching. Shot of the Tube in London. Another view of St Pancras Station. City center of Leicester. Overall, pleasant enough city for a work trip but not much to see for a tourist. In the evenings the city center felt pretty empty. Pedestrian road (New Walk) in Leicester. Used this path each day from the client location to the hotel. Near the University of Leicester campus. Passed through on the way to lunch one day from the client location. On a slightly unrelated note, the weather was ridiculous. During the span of 1 hour it snowed, rained, and was sunny. 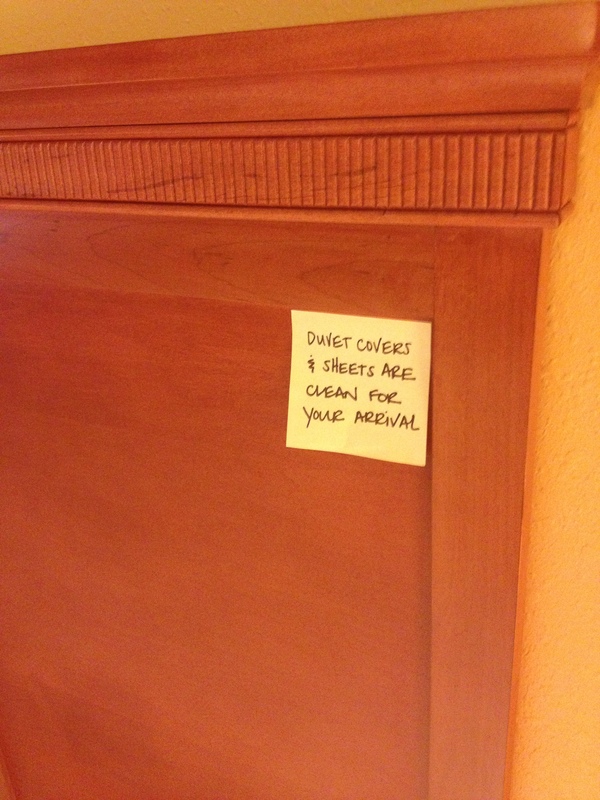 Creepy stick-it notes left by housekeeping on the headboard of the bed. The worst part about this is that I did not notice this note, which I assume was present the entire time since I decline housekeeping while staying, for 3 nights. As I was getting ready to leave this morning I noticed it. I don’t know if it is limited to this specific Hampton as I haven’t seen it at others recently. However, as this has proven, I may have just missed it previously. On a more positive note, I do appreciate the fact that Hampton is trying to make sure that guests know that they are receiving clean bedding. I just think that there must be a better way to do it! Here is a picture of the note. First, I need to provide some background. I took a flight for business this past Monday morning and on the United flight from Houston to St. Louis the flight attendant forced all passengers to remove liquids (waters bottles, coke, coffee, etc.) 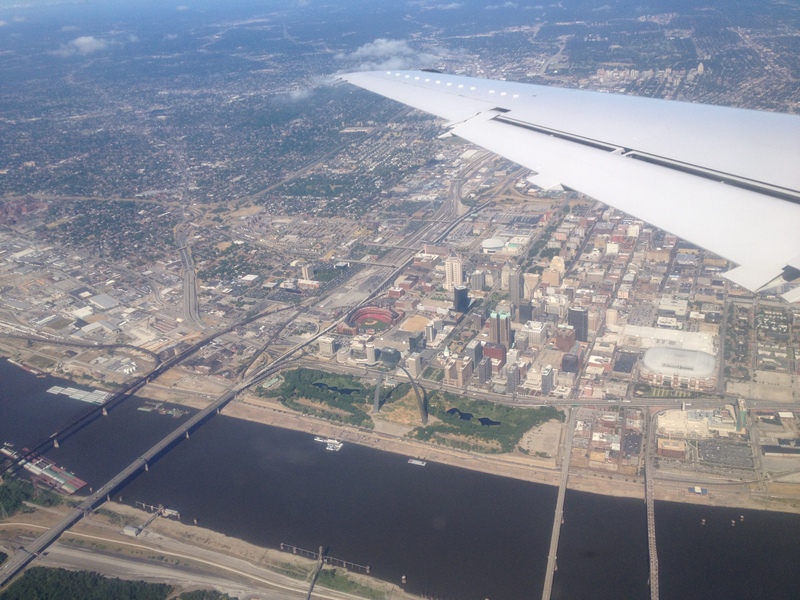 from the seat back pockets during takeoff/landing as she claimed this is a FAA Regulation. I have flown a fair amount in the past 5 years but have never once heard this pronouncement. I have flown on the type of aircraft before as well and never heard it. I was just wondering if anyone else has ever had a flight attendant force you to hold water bottles during takeoff/landing? These prices are based upon one person ordering a typical entrée with a beer or glass of wine. I know this will not be useful to everyone (especially if I don’t start posting some reviews!) but I hope that it can at least be useful as a rough guide.